Hot Safari is a 5 reel, 25 payline slot game with a 96.17% RTP. This UK Online Slot comes with Free Spins, Scatter Symbol and Wild feature. Hot Safari on MoneyReels.com allows slot players to dig into the realities of African Savannah and everything that revolves around it. The origin of amazement in the interface can be seen in the way the sunlight illuminates from behind, the reels, which gives the game screen an outpour of orange glow. Hearing the word “safari”, there is a connection that strikes the mind with nature. Hot Safari, a popular online slot on MoneyReels features lovely nature sounds and soundtracks that gives the slot player a signal pointing to wildlife hunting. This online game gives an African feeling in the fashion in which the game takes in theme and some certain features. The reels of Hot Safari are mostly inhabited by wild African animals. In the online slot, the first group contains card-inspired symbols with payouts as usual which I'm sure that will take a new outlook going forward. The number 10, Jack, Queen, King and Ace appear frequently on the game screen. The dominant symbols in the online slot are animal symbols which are interesting and inspiring. Pragmatic Play is one of the fastest growing mobile and desktop providers of digital casino games for the online gaming industry. Their passion for premium entertainment is unrivalled as they strive to create only the most engaging online slots that remain appealing, relevant and filled with fun. Games similar to Hot Safari Pragmatic Play for a while have had sweet experience and innovations in the gaming industry. Slot games like Ancient Egypt slot game, Lucky New Year Slot and Chilli Heat slot have features, colouration, backgrounds, and a bit of the same interface that gives a taste of everything natural to our play time. Out of the fantastic animal symbols which symbolizes the reality of wildlife holding the theme of the online slot is the Meerkat, an Antelope, a Zebra, a Rhino and a mighty Elephant. Am I in the forest? Definitely, NO! You're just a click away into wildlife. You shouldn't miss what each animal symbol offers on the reels during this amazing safari. 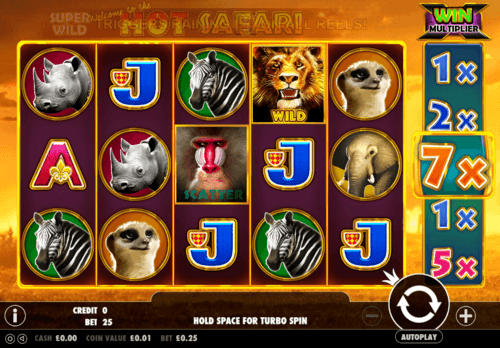 Without doubt, this slot game is inspired with all the animals residing within the Safari park. Looking closely, you'll see that the reels are slightly transparent and how they tend to get caught on a flame. Why not give this slot a spin here by visiting MoneyReels.com to play for real online? For Slot game lovers, Hot Safari is a newly launched game which we highly recommend for the exciting experience it can provide. Play this one of the best Pragmatic Play slots which bring you closer into winnings that are epic with the wildlife of Africa at MoneyReels now. Yes, you'll always feel you're in the hunting sphere! It's all fun. Fully-packed. Hence, the online money slot has easy gameplay with a command bar resting at the bottom of the game board, below the reels. Hot Safari definitely contains all the features you need to enjoy a slot game: classic graphics bringing all the wildlife element to life, an immersive universe, and high stakes. Do you want to end up with a game that resonates in memory long after you leave it? Then, adding bonuses to the mix is the way to go. The five spinning reels of the game display 3 symbols each, with an extra reel covered in multipliers. +/-: Adjust the coins size to set the reels in motion. Autoplay: The reels will turn without interruption for a chosen number of times. This also allows any slot player to set the game to autoplay which makes the reel spin on their own. Play: Set the reels in motion. In this online slot, the Lion symbol is the Wild, and it can form winning combos both when it is substituting in a win, or on its own. Luckily, when the Lion symbol appears in the centre on any reels, it expands to the whole reel. To trigger the Super Wild Bonus, you only have to make Super Wild Symbol land on the 6th reel. During this bonus round, one wild symbol is added to each of the five reels in random positions. The 6th reel, which on other online slots is considered as the “power reel” holds multiplier values that go as follows: x2, x9, x10, x3, x2. When you hit a win on one of these reels, the multiplier will apply to that win. The highest award is given when you land Wilds in the center position on all 5 reels. At that point, you stand to win x10 multiplier to your winning combo. The Baboon head is the Scatter symbol, and this is how to simply trigger the Free Spins round: just land 3 or more of the Scatter Symbols. Once triggered, you will be awarded 10 spins, but you can win more of them along the way as you keep playing. Do you want to play free spins game in this online slot? Then, you should draw at least 3 scatter symbols with the baboon image on a single spin anywhere on the main reels. During 10 free spins, you can win more free games without a limit hitting 3 or more baboon Scatters! All features remain active during the free spins! Unlike other slot gaming structures and adventures. The Hot Safari Slot game is available to everybody as it is a UK Friendly slot that plays equally well in your home on computer as well as your Mobile Devices.